Danny Dollar sings the first verse of my favorite Elvis song ("Big Boots" from the movie G.I. Blues) for me in the cab of his truck parked in front of the Art Barn courtyard in downtown Nashville. The day is overcast. There are spats of rain coming down and Danny worries about his equipment and whether or not he'll be able to do his show. Ted Otero, an engaging, recently arrived to Nashville singer and guitarist from New Mexico, is playing on the stage with the white canopy. Things begin to clear up as Danny waits to be introduced in his light blue Elvis costume and matching cape, rhinestones glittering, shaped black hair, generous muttonchop sideburns. He walks onto a small side stage under an umbrella. There's not much room to flash big moves but he can still emote like The King. Like Bruce he has The Voice and flawlessly sings rockers like "Rip It Up" and crooners like "Love Me Tender." His performance is, by necessity, far different from Bruce's. He has no lights or smoke machine and must make do with a sophisticated, computer assisted disc system, instead of a band. 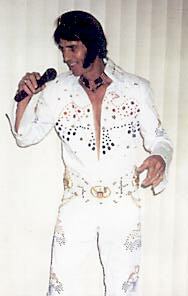 Most of the people out here aren't familiar with the Vegas Elvis, they know him best from his movies. "It took me about two weeks to figure out the Nashville audience," Danny says. "I don't do a lot of the gyrations that I used to. I basically entertain an older crowd." The audience is munching on ice cream, fries, hotdogs, and drinks from the many snack shops that surround the Art Barn courtyard. People walk by, jaws dropping in amazement when they see and hear Danny's performance. Some request songs and sing along, drop money in his basket, buy some grub at the snackeries and move along when they finish their eats as other folks arrive. The audience accumulates steadily as the set continues. People wander in and out of the Art Barn. If the music were overpowering it wouldn't be as conducive to the eating, chatting, relaxing, and friendly coming and going of the crowd. Elvis must have put in a good word upstairs because soon the sun breaks through the cloudy overlayer. Elvis impersonation depends a lot on the audience's willingness to go along for the ride. Danny's performance pulls folks in from off the street. He plays to this audience and sometimes the audience wants to play along. Women shriek. Some folks begin clapping along. One lady gives him a thumbs up. On the street a truck passes with FEAR THIS printed on its hood as visitors crowd the sidewalks on both sides of the street. 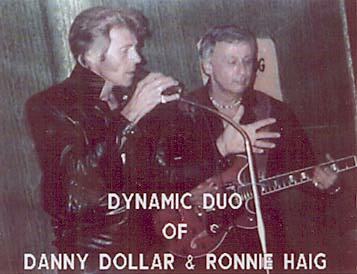 Danny Dollar began singing Elvis in 1958 when he was 15 years old. He'd first seen Elvis on the Dorsey Brothers Show. He was also listening to black rhythm and blues on the radio coming out of Chicago. He liked the way the rock & rollers delivered their music and knew right away that was what he wanted to do. He's been traveling most of his life, playing music. In the sixties he was in Los Angeles and recorded there. Rick Nelson helped him put together a band. He played at the People Tree and eventually had a club of his own. Danny came back to Indiana about three and a half years ago when he married, Tony, a lifelong Nashville resident. "California was earthquakes and crazy people." He shakes his head. "I was ready to go." He loves Nashville and intends to live the rest of his life in Brown County. In 1976 he recorded in Florida with the Allman Brother's Band and began his lifelong friendship with Greg Allman. 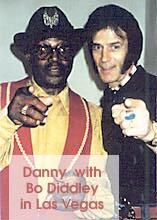 You can find Greg's picture along with that of another pal, Bo Diddley, on Danny's billboard announcing his show. He and Bo were on the same circuit in California along with Johnny Otis and others, mostly black entertainers. Danny quit doing his act for a long time after Elvis died. "I don't know what happened. A part of me died, I guess." After a while people started trying to get him back in the saddle. "Everybody's doing it," they'd tell him. It's not going to hurt anything." "I still don't feel right about it," he says. "I want to get my own record." Greg Allman is helping Danny with the planning of the record to be produced soon on Alligator records. It's more of a country album and Alligator has already accepted the tunes to be recorded. "The sideburns are going, my hair is blond, it's going back. I want to be me again. The Elvis thing is fine, it helps me keep the bills paid. I enjoy doing it. Elvis was such a powerful man. He had it all. He had the looks. You can entertain people but you're not going to do what he did. That was his magic." "We're not out to hurt people," Danny says about performers in general. "That's why we entertain. We want to please people. We want to take their worrisome minds off things. You can see the peace in the people. I saw that in Vegas. I thought, 'God, thank you for letting me do this. For letting me experience all of these people, all of these different color people, they're at peace here.' That's what it's all about." To walk in a room full of smoke, conversation, and an empty bandstand is usually sort of sad, like you've missed something. About the time you got seated, you see the band coming back on the stage and then you hear, "Alright now, here's the guy you came to see tonight, Let's give it up for Danny Dollar". The crowd comes alive, The bands starts playin' a slowed down version of Elvis's "Steam Roller" and the (up till now) quiet girls in the audience start comin' alive. From the rear of the room the spotlite grabs Danny as he enters singin' "Well I'm a Steam Roller Baby". Slowly making his way down toward the stage dressed in all black leather and shades, comes the one man that can capture "that feeling" of the "King". From the time Danny enters the room -there's a feeling comes over you. The smile, the look, the voice, the moves, whatever, it takes you back to a time when "E" himself did it. From "Jailhouse Rock" to "Can't Help Falling in Love" from "That's Alright Mama" to "Cryin' in the hapel" he takes you through a time when Rock & Roll was magic. When you can't sit down and listen. You have to get up. You have to dance. I've had the pleasure of playing guitar with my band behind the great Danny Dollar countless times to crowds like that. The screaming girls, the sell out crowds, and he DOES deliver! Over the many years of playing and singing in all kinds of places and in all kinds of towns, behind many so called Elvis impersonators, I've never seen anyone do it like Danny does it. Whether he's in a jump suit with a cape or a pair of blue jeans and a flashy shirt, Danny flat gets it done. Hats off to a guy that deserves evry bit of recognition he can get. I'm proud to call Danny Dollar my friend!